This package includes a three-hole punched, loose-leaf edition of ISBN 9781119021179 and a registration code for the WileyPLUS course associated with the text. Before you purchase, check with your instructor or review your course syllabus to ensure that your instructor requires WileyPLUS. The Dicho y hecho that became one of the most widely used Spanish textbooks in the 20th century has evolved over the last two editions into an innovative language program fit for 21st century learners and instructors. Meant for a beginning Spanish sequence, this edition retains its characteristic easy-to-implement, lively approach, and preserves its emphasis on sound pedagogy and its commitment to innovation and a learning experience that is highly effective, flexible and enjoyable. 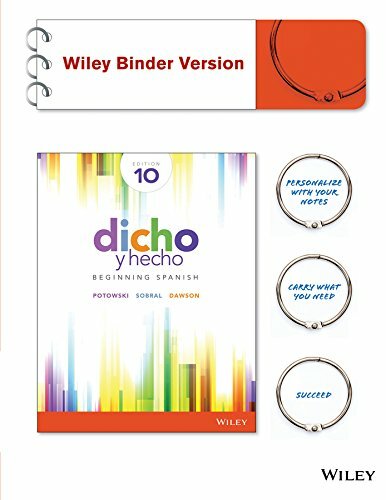 Dicho y hecho, 10th edition employs a suite of online learning systems to bring language learning into the modern classroom while keeping it simple.